CORONA, Calif., - The Pro Circuit Factory Support Team is now accepting applications for its 2013 rider support program. Now is your chance to join the Pro Circuit Factory Support Team family, and be represented by one of the most legendary companies in the moto industry. The 2013 program promises to be one of the best to date, and the team is excited to share its plans with those who are accepted into the program. 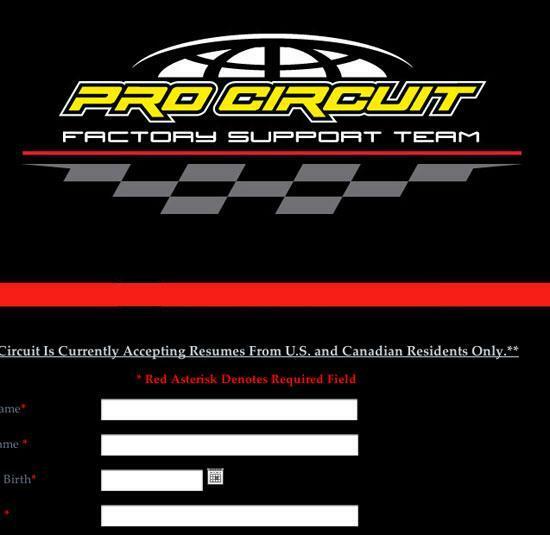 All interested candidates must submit their resume through the Pro Circuit Factory Support Team website to be considered. Applications sent via traditional mail will not be accepted or reviewed. Please visit the Pro Circuit Facebook and Twitter for the most up-to-date information on all things Pro Circuit.